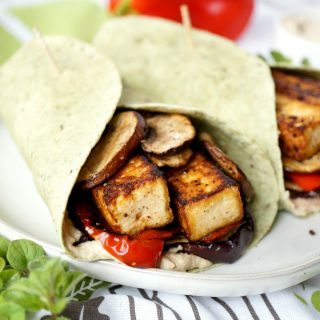 These easy and tasty Vegan Grilled Veggie & Tofu Wraps are filled with charred vegetables, smoky tofu, and creamy hummus for a perfect make-ahead lunch. 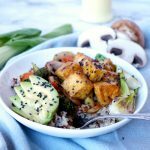 I have been on a massive tofu kick basically since I went vegetarian, and I am always looking for new ways to prepare this little superfood! I pretty much eat it in some way, shape, or form every single week. Today, I figured we should go back to basics! What’s everyone’s go-to meal when they’re in a pinch? Usually a sandwich or wrap. 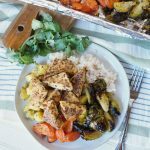 These grilled veggie & tofu wraps can be eaten warm OR cold so they’re perfect for a packed lunch or meal-prep situation. 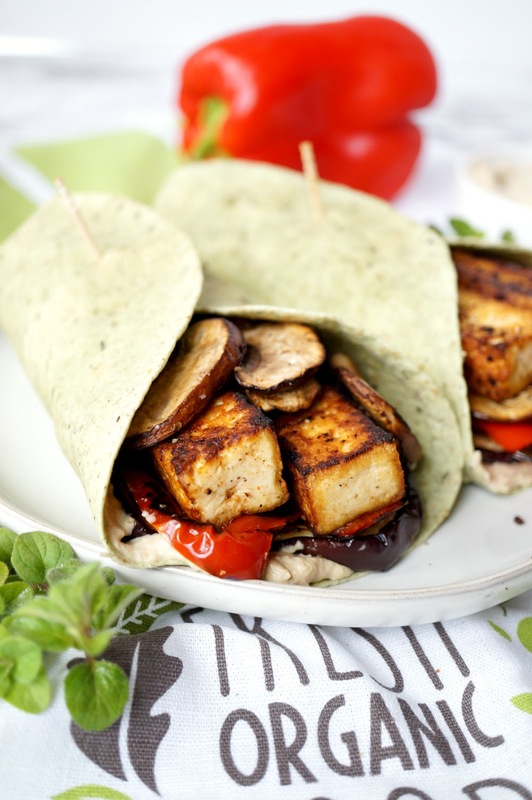 I hope you guys love these grilled veggie & tofu wraps with hummus as much as I did! I know I’ll be adding these to my regular meal prep rotations 🙂 Happy cooking! 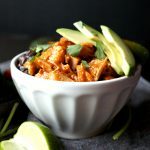 Looking for more vegan quick meals? Check out my Roasted Ratatouille Sheet Pan Meal, Vegan Sausage Sheet Pan Meal with Sweet Potato & Kale, Vegan Chorizo Taco Chili, Pesto Tofu Buddha Bowls, and Spaghetti Aglio & Olio. First prepare the tofu. Slice the block in half width-wise to create 2 thinner pieces. 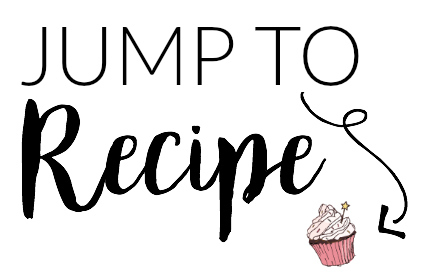 Wrap in paper towels, and place a cutting board on top with a few cookbooks to press out the excess moisture. Allow to sit for at least 10-15 minutes. After the tofu is drained, cut into 16 even small strips. In a medium bowl, whisk together the vegetable oil and spices for the marinade. 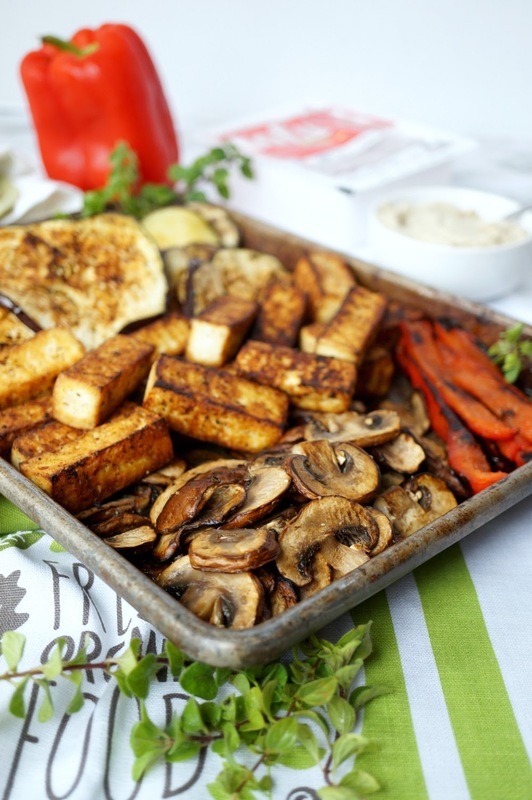 Allow tofu to soak while you prepare the rest. Meanwhile, prepare the vegetables. Wash and try well. 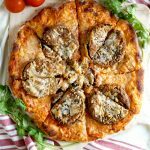 Slice the eggplant into rounds, cut strips of bell pepper, and slice the mushrooms thickly. Heat a grill pan on the stove on medium-high (you can also use a normal pan) and add a bit of the oil. 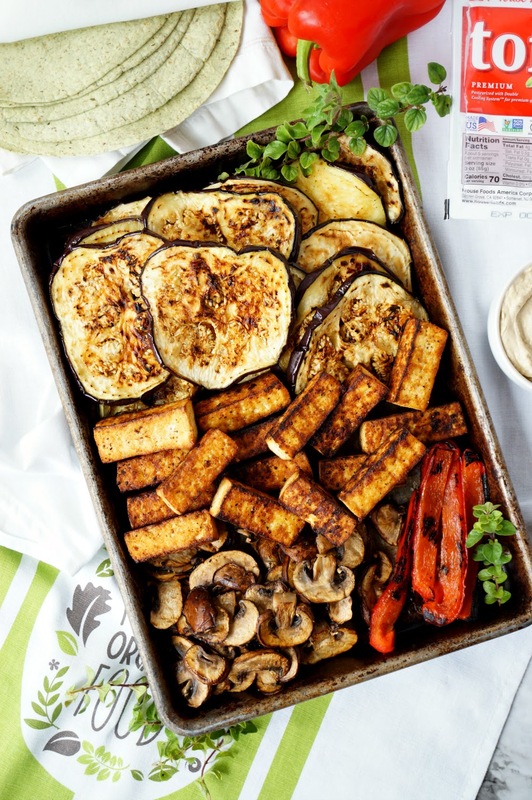 Grill vegetables a few pieces at a time, making sure to not crowd the pan as to avoid everything getting soggy. 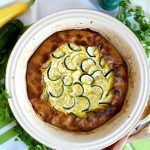 Cook in batches until all veggies are ready. Sprinkle with garlic salt to season. Finally, cook the tofu until golden brown and crispy. Flip several times so each side is cooked through. 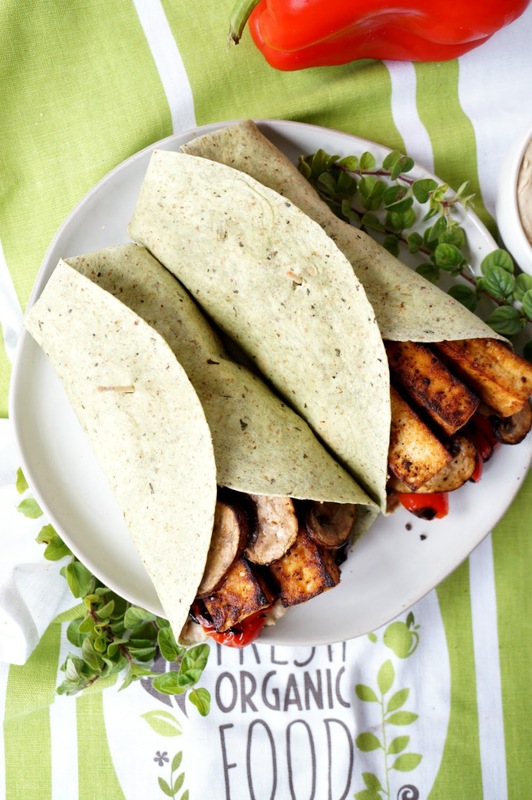 When ready to serve, spread some hummus on each of 4 wraps. 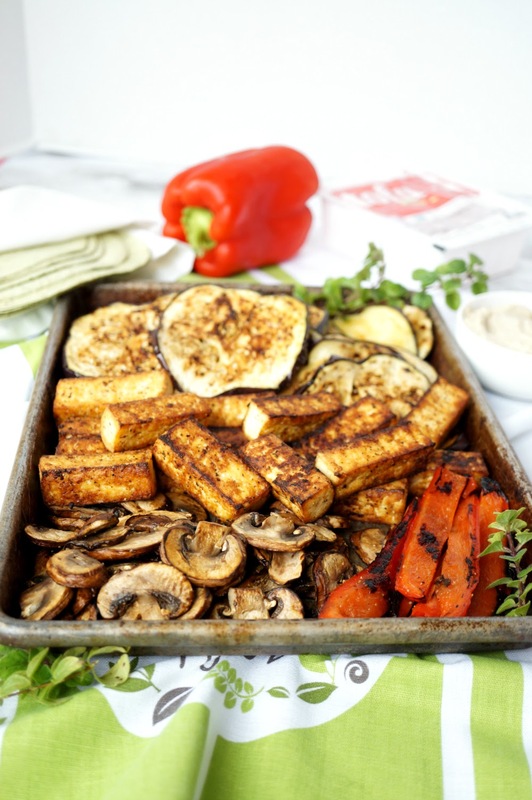 Top with some slices of grilled veggies and place 4 pieces of tofu on each. 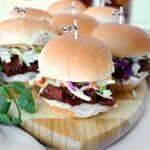 Roll up and serve immediately, or store in fridge for later.